It is always hard to ‘do’ a city in a day and I certainly could have spent more days in Lisbon, but in the end chose not to. You can see a lot in a day, as I found when I headed along the coast to the Portuguese capital. We walked to Estoril station and bought an all-day ticket for the train which we took to Belém. Belém is most famous for being home to the tastiest pastéis de nata (custard tarts) in Portugal. We tracked down the original 1837 Confeitaria de Belém and indulged in crisp custard-filled pastry nests flame-topped at 200 degrees in historic vaulted tea rooms. We timed it perfectly as a line was forming once we sat down, but even if we had queued, these melt-in-your-mouth pastries would have been worth the wait. Next to the Confeitaria was the Mosteiro dos Jéronimos, a beautiful Unesco-listed monastery built to herald Portugal’s Age of Discovery when Vasco da Gama found a sea route to India in 1498. We strolled across to Rio Tejo and Padrão dos Descobrimentos, the 52m high sculpture of sea explorers built to commemorate the 500th anniversary of Henry the Navigator’s death. 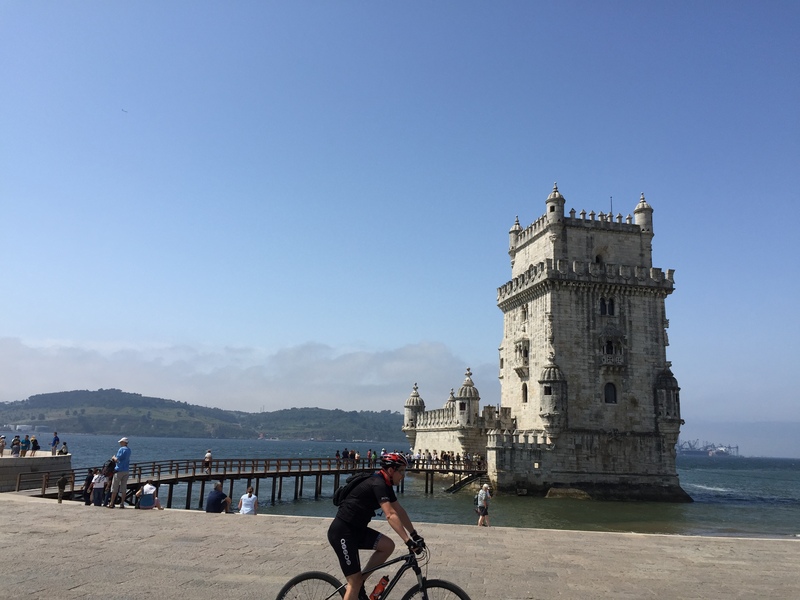 The sea breeze bustled us down the riverfront to Torre de Belém, another World Heritage-listed fortress symbolising dramatically the Age of Discoveries. Resembling a mighty grey chess piece, 2015 marked the 500th anniversary of this tower which was built to defend Lisbon’s harbour. Across the water was the spectacular Ponte de 25 Abril, which resembled the Golden Gate bridge in San Francisco more than a little. Annoyingly, our tickets did not work on the tram into Lisbon where we alighted at Praca do Comércio. My eyes immediately fell on the Arco da Victoria, but the whole of the 18th century square was enthralling, with its central statue of Dom José I, buzzing throngs and rattling trams. It was staggering to think that only 41 years earlier the square had witnessed one of the most remarkable revolutions, an almost bloodless coup that ended Western Europe’s longest-lived authoritarian regime is still celebrated annually in Portugal on April 25. We strolled under the arch and up Rua Augusta which felt like Las Ramblas in a way, bustling with tourists dining under umbrellas along the central strip. The Baixa district was built after the devastating 1755 earthquake and was the world’s first grid system. 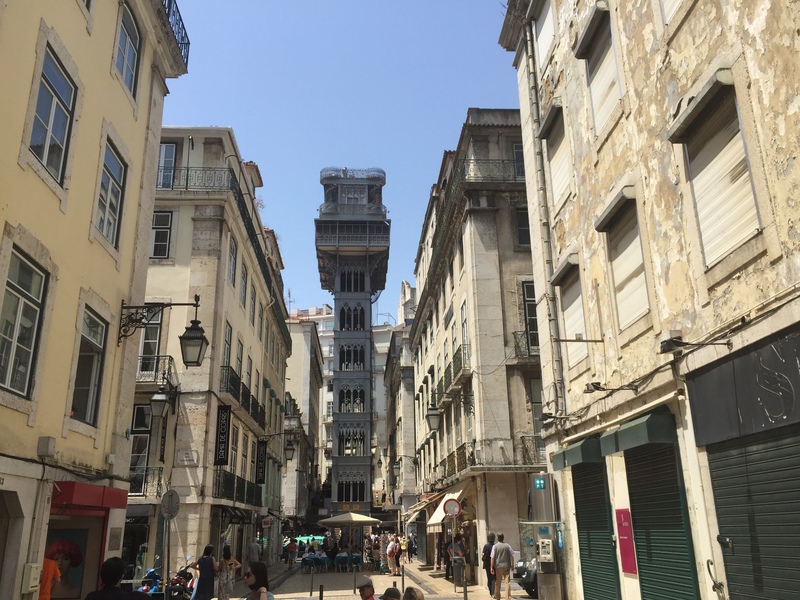 We explored the enchanting lanes with unexpected treasures greeting us down some like the Elevador de Santa Justa, Lisbon’s only vertical street lift which was designed by Gustave Eiffel’s apprentice. For lunch we had delicious Leitão (suckling piglet) sandwiches at Nova Pombalina on Rua do Comércio 2, with fresh-as-they-come fruit juice to wash it down, all served within 60 seconds of us ordering. 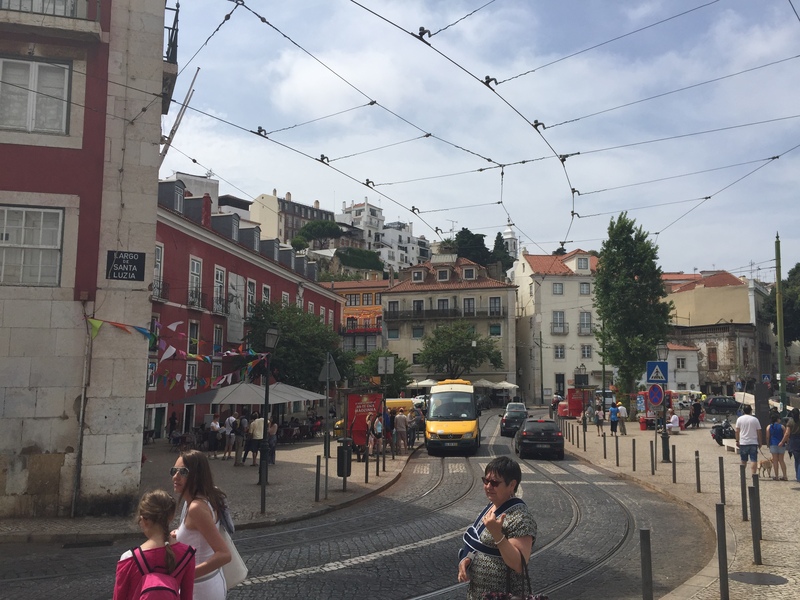 We took the famous Tram 28 up the winding hills from Baixa to Graça, a trip that felt more rollercoaster than road at times. 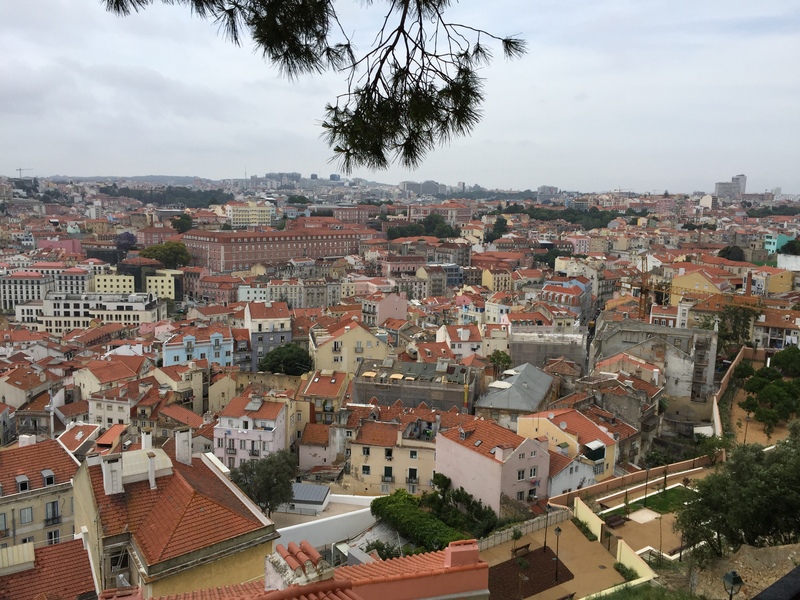 From here we strolled a couple of blocks north and up a steep hill to a view as breathtaking as the gradient of the street we had climbed, the Miradouro da Senhora do Monte, Lisbon’s highest lookout. The castle loomed on the opposite hillside across a sea of terracotta rooftops and tangled undulations of streets. South of here we discovered Miradouro da Graça with a gorgeous vista back across central Lisbon. We cut through narrow downhill lanes and skirted along the narrow cobbled Costa do Castelo around the ancient castle battlements. Every now and then we would peek another stunning viewpoint on our right across the city. Down the hill we fell into the famous Alfama district and wove our way through a labyrinth of ultra-narrow laneways with colourful tinsel and bunting criss crossing above us. It felt like Southeast Asia – halfway between a tourist trap and a spot for locals that was waiting until nightfall to come alive. We eventually stumbled out of Alfama and up to the beautiful Sé cathedral, which was a humbling and impressive structure, even if it lacked some of the grandeur of Barcelona’s cathedrals. 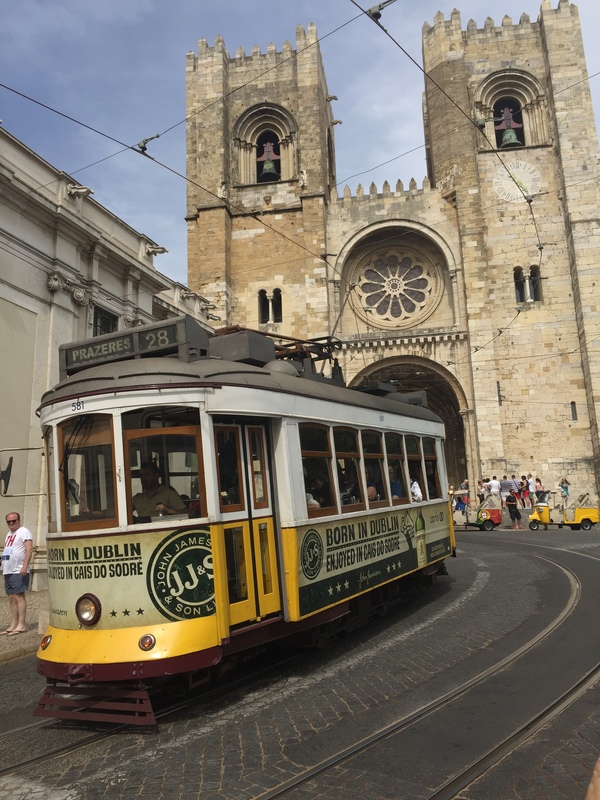 I loved the sight of Lisbon’s iconic yellow trams rattling past the entrance to the Sé through narrow streets you would not believe they would fit down until you saw it. On the other side of the Baixa we cut through the Chiado district to the Bairro Alto district, a more modern part of town which slightly disappointingly still had lots of mildly tacky bunting and tinsel across its streets. Overall I still cannot settle on a final opinion of Lisbon. I loved the vistas, the rattling trams, the old school architecture and the fascinating history of the post-earthquake city, but it just couldn’t hold a flame to Barcelona, perhaps my favourite European city. 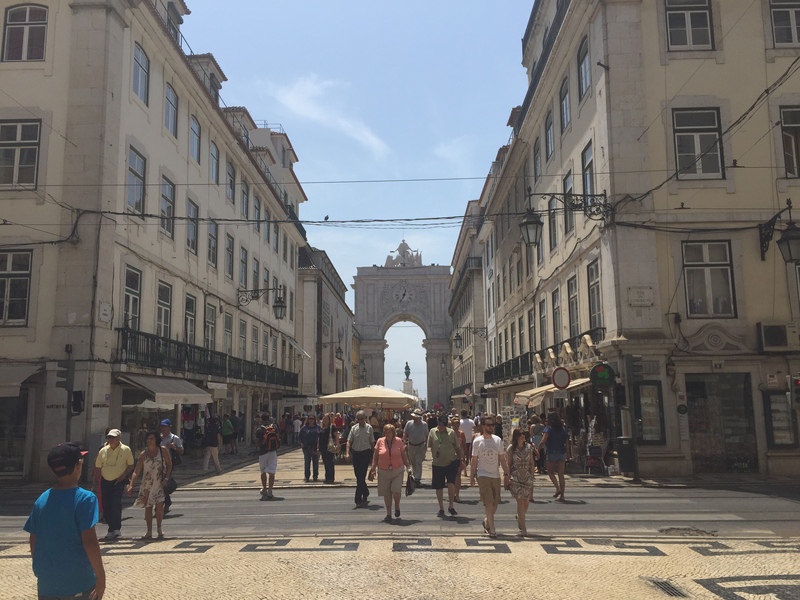 If you include Estoril and Cascais further round the coast (where i and a gorgeous linguini that night), then I certainly love the region, I just feel that after a day in Lisbon it did not capture my soul quite as much as I hoped. Have you been to Lisbon? What did you think? 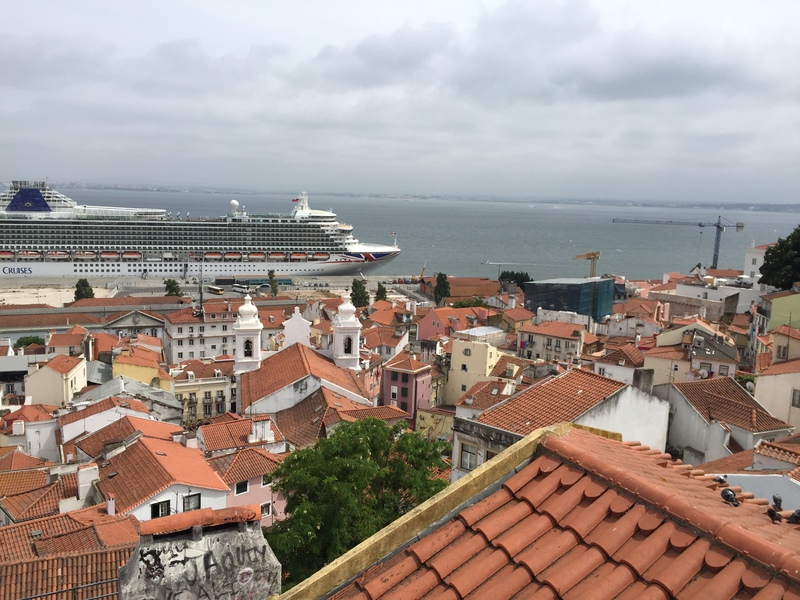 This entry was posted in Europe, Travel, Travel Videos, Uncategorized and tagged Europe, Lisbon, Portugal, Travel, Travel Videos. Bookmark the permalink. JP you make me so jealous….keep it up. Haha cheers Andy! Hope all is well with you.